San Francisco: As Cadillac commemorates its centennial, the CTS sedan represents a fresh start for Americas oldest luxury brand. Finally, after watching baby boomers abandon the company for European and Japanese choices, Cadillac has given people under 70 years old something to savor. 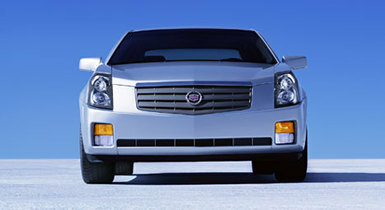 Debuting for 2003, the CTS introduced an edgy, folded look to Cadillac. The midsize CTS looked like no other Cadillac, and like nothing else on the road. Now, with the 2004s arriving, familiarity has made it look more attractive. Not only is the shape radically squared-off, but the detailing is superb too. The headlamp units, with their vertically stacked projector beams, are cleanly rendered works of art. The alloy wheels are gracefully wrought. The interior surfaces avoid the dry, fake-leather look favored by GM interior designers. Even the real wood is carefully meted out, appearing only on the top of the steering wheel, shift knob, and door pulls. Previous junior size Cadillacs failed because they didnt capture the Cadillac essencebeauty, style, power, and exclusivity. In the 1980s, the ill-fated Cimarron was hardly distinguishable from the Chevy Cavalier upon which it was based. The 1990s brought the Catera, a better vehicle based on a European Opel, but it missed something essential about Cadillacsa strong American character. Well, after a week with a shiny new 2004 CTS, I can say with some certainty that this time they got it right. The CTS is big and solid enough, but still handles and parks like the midsized BMWs and Lexuses from which it hopes to lure its customers away from. A good sign: First year CTS sales were about 25 percent above projections. The CTS offers two engine options, neither of them a V8. The standard powerplant is a seriously reworked 3.2-liter V6 that generates a competitive 220 horsepower and an equal 220 lb.-ft of torque. Shockingly, it comes only with a manual five-speed transmission. A pink 59 Elvismobile this is not. Boomer Europhiles expect a stickshift in their BMWs and Audis, so Cadillac has given them one. For everyone else, the automatic-equipped model has a new dual-overhead-cam 3.6-liter V6 engine for 2004, with variable valve timing. The increased size and efficiency boosts horsepower to 255 and torque to 252 lb.-ft., for 20 percent more peak power and 13 percent more peak torque than the standard engine. My White Diamond Premium 2004 test car came with this new powerplant, and it lived up to its billing. Not only did my CTS rocket down highways and byways like a sports car, but it felt incredibly stable doing it. As part of a many-featured package (described later), my tester enjoyed a sport suspension with rear load leveling, performance brake linings, and variable assist steering, which explains at least partly why this car felt so unlike its ancestors. Official fuel economy ratings were an encouraging 18 city, 28 highway - not traditional Cadillac numbers. My tester averaged 18.4 mpg during my substantially freeway test week. I gleaned that information from the easy-to-use Driver Information Center, which lives in the instrument panel. The manual-equipped, 3.2-liter model comes with Cadillac levels of luxury, including leather seats and steering wheel, power windows, power locks, power drivers seat, power and heated outside mirrors, remote keyless entry, cruise control, an AM/FM/CD with seven speakers, and the famous Cadillac Twilight Sentinel auto-on headlights. Mechanically, the car gets a four-wheel independent suspension, four-wheel disc brakes with antilock, and all-speed traction control. Safety features include front to rear head-curtain side impact air bags, automatic door locks, and a theft-deterrent system. But thats just the entry point. My tester featured the nearly $10,000 1SC Equipment Group, which pushed the vehicle up into the luxury stratosphere. Highlights included the 3.6-liter engine, five-speed automatic transmission (the only choice with the 3.6-liter), a killer Bose music system with in-dash CD changer, 10-way power drivers seat with memory, wood trim, heated front seats, and the sporty suspension mentioned earlier. If you really want to go wild, you can order up GMs DVD Navigation system, with 100-channel XM Radio (subscription costs extra). And my cars fancy paint cost $995 extra, not unusual for premium surfaces on the competition. The CTS pleased with its handsome gauge typeface, an eager-to-please feature-packed audio system, genuinely exciting styling, and apparently high-quality assembly and materials. The CTS surprised with its restraint without dullness, "Headlamps suggested" screen message at dusk, and dash light dimmer mounted on the ceiling. The CTS delighted with its silence at speed, the penholder slot by the shifter base, and a radio screen that displayed, for some stations, dial location and also call letters, program type, and even a promo message. The car dismayed somewhat with its microscopic glove box, inaccurate reading outside thermometer, and extremely heavy trunk lid. An optionless manual-equipped CTS prices out at just $30,140, while my tester, with packages and extras, came to $43,530. With ordinary midsize sedans pushing the $30,000 mark, the standard CTS is something of a bargain. The loaded model matches up well against its midsize luxury competitors.